In the past decade or so, senior lenders, such as your high-street bank, have reduced the amount of money they will lend to a property development project, which is now usually between 50-70% of the total amount needed. As a result, there has been an increase in the options available, like crowdfunding platforms and peer-to-peer lending communities, to make up the shortfall in funds. Equity, implies ownership by means of shares in a company owning the asset. Debt, lending under a loan agreement or bond secured against the asset or the company. The capital stack is usually made up of several layers consisting of either debt or equity. Senior and mezzanine debt makes up the base of the capital stack, and equity financing making up the rest. The four most common lending types found in the capital stack are senior debt, mezzanine debt, preferred equity and common equity. The entities providing the funds can be called either creditors, lenders or investors. Is usually the largest proportion of funds and is almost always secured by a charge over the asset. Investing via the senior debt is the least risky among the other options in the capital stack due to the first charge over the asset itself. As a result of the first charge along with being first in the order of priority, Senior lenders almost always receive the lowest level of return. Is positioned above the senior debt, meaning that investors will only get repaid once all senior debt obligations have been met. This makes mezzanine debt more risky than senior debt, but less than equity investment with the projected rate of return for investors being higher than senior debt. Mezzanine lenders take a "second charge" over the assets which means that they are second in line to recover their capital in the event of a default. 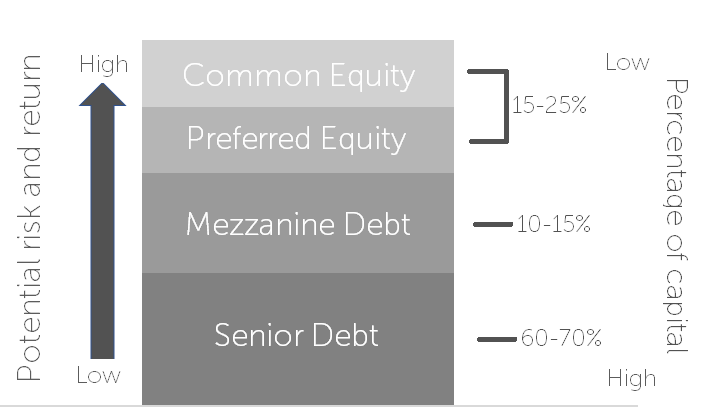 Sits above mezzanine debt and marks the beginning of the equity financing layers of the capital stack. Unlike with debt investors, who are usually paid a fixed interest rate, returns to equity investors comes from the profit generated by the Special Purpose Vehicle (SPV) owning the property. As such, they can only be repaid after the company has met its obligations to its lenders. As a result, preferred equity carries more risk that debt and typically generates a higher projected return, however the actual return depends on the actual profits made by the company. Sometimes they will be more than the projected, sometimes less. Where possible CrowdLords includes a "minimum preferred return" which is payable to preferred equity investors, prior to other shareholders receiving any dividends. Is usually held by the property developers or landlords themselves and is paid last. Holders of common equity are usually entitled to any profit generated after all the other layers have been repaid. Learn more about the differences between equity and debt investments in our previous blog. View the equity and debt investments opportunities funded through CrowdLords here. Investing puts your capital at risk and returns are not guaranteed. Please read our full risk warning before deciding to invest. Frequently Asked Questions: What is an IFISA? Crowdfunding and P2P Lending - Vive La Différence! Is this the year alternative finance goes mainstream? How do you decide which investment is best for you?